HUNTINGTON, WV (HNN) - Every year the Huntington Police Department and law enforcement agencies across the state and nation pause in May to remember comrades who gave the ultimate sacrifice in the line of duty. The National Peace Officer's Memorial Day observation had to be moved inside the municipal court at the Jean Dean Building, 675 Tenth Street, due to threatening skies. Hon. R. Booth Goodwin II, U.S. Attorney Southern District of WV, served as this years guest speaker. Both he and Huntington Police Chief Skip Holbrook exhibited humility honoring those officers who perished. 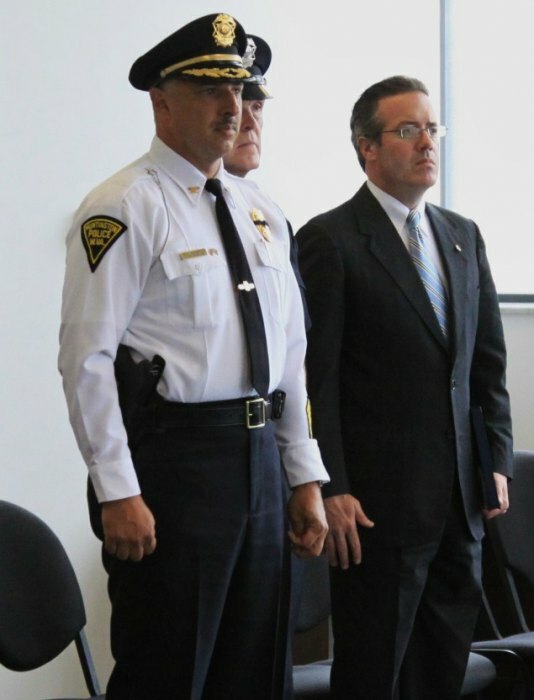 Simultaneously, the two men complimented each other on the professionalism and solid investigative work that has brought about a city/federal cooperation to reign in drug dealers and addicts who had perched in Huntington as an easy location to sell their wares. Under Chief Holbrook, the Huntington crime rate has plunged. Goodwin complimented him as the city's best police chief for the accomplishments of he and his staff. Mayor Kim Wolfe delivered a proclamation in honor of "National Peace Officer's Memorial Day" and FOP National Trustee, Herman Becket, read the roll call of fallen officers. Two scriptures reminded officers of duty and sacrifice. "Blessed are the peacemakers for they shall be called sons of God," quotes Matthew 5:9. And, as an expression for officers daily willing to lay down their lives for a brother or sister officer but civilians in the line of fire, the verse in John 15:13 echoed the loyality and sacrifice: "Greater love has no one than this that he lay down his life for his friends." Although Huntington has not lost an officer in the line of fire since 1981, when both Paul Harmon and James Mills, laid down their lives, Holbrook himself holds these observances close to his heart. Prior to taking the job of Huntington's Police Chief, he was the first to arrive on the scene of an "officer down" in North Carolina. This past year he returned to that state to honor a veteran SWAT team member who had fallen. Huntington's fallen officers include: Issac Mitchell (1876); Oscar Christian (1914); Charles Ball (1923); Lt. Fred Bricker (1940); and Clemmie Curtis (1976), in addition to the aforementioned Officer Harmon and Officer Mills. The observance included tributes to fallen officers from Ashland, Ky., Boyd County Police Department, Carter County Sheriff's Department, Elliot County Sheriff's Department, Grayson Police Department, Greenup Police Department, Lawrence County Sheriff's Department (KY); Louisa Police Department, Lawrence County Sheriff's Department (OHIO), Cheseapeake Police Department, Gallipolis Municipal Court, Ironton Police Department, Mason County Sheriff's Department, Milton Police Department, Kenova Police Department, Fort Gay Police Department, Kermit Police Department, Lincoln County Sheriff's Department and the Putnam County Sheriff's Department.